Three different shopping opportunities can be found at Landmark Park during your visit. Visit the Martin Drugstore and enjoy a milkshake, malt, ice cream or soft drink from our operating soda fountain. Enjoy the large display of drugstore items, including old medicines, tonics and health care products. Wednesday – Saturday: 10 a.m. – 4 p.m. Located in the park’s Interpretive Center, our giftshop features nature-related items such as books, toys, rocks, minerals, astronomy guides and more. 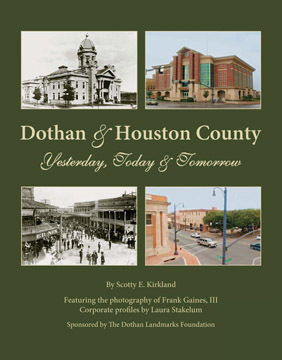 “Dothan and Houston County: Yesterday, Today and Tomorrow” chronicles the area’s past, present and future. Never-before-published, historic black and white period photos are paired with color views of the same scenes as they exist today, photographed by Frank Gaines. Also included is a brief history of Houston County, written by historian Scotty E. Kirkland, and business profiles by Laura Stakelum. This large format, hardcover, color volume is available for $43.54 (plus $7 to ship), published by Beers and Associates. Click here to download the order form.